There was a hallway in the house I grew up in—which at this moment is in the process of being sold—where the wallpaper was red and gold velvet, and walking through it I felt swallowed. Sometimes I loved this feeling, and other times I rushed to get out. I can think of haunted hallways in many houses I know. 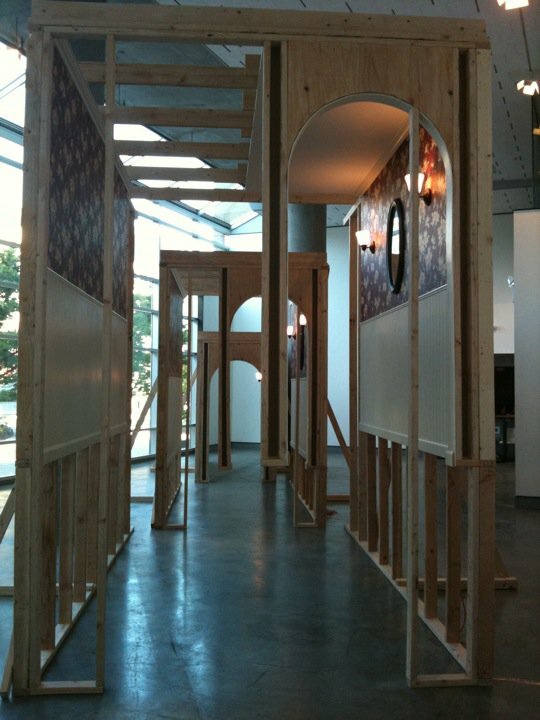 San Francisco-based artist Primitivo Suarez-Wolfe's installation of domestic hallways at Open Satellite, Set Apart from Memory by Time, is in three repeating sections. 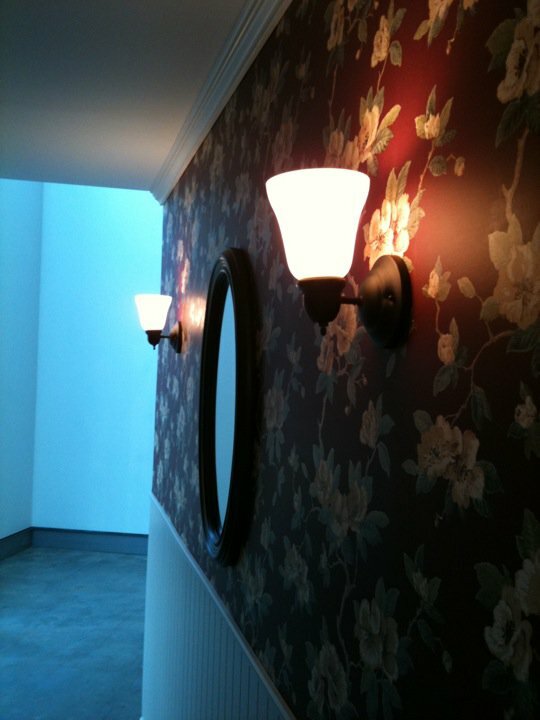 Each section is exactly the same—same amount and type of wallpaper on the wall, same two lit sconces, same mirror, same molding—except for the growing negative space around it, which is represented in areas of unfinished wall studs. The smallest hallway is the size of a regular home hallway: The mirror is at chest height, and any more than two people trying to stand abreast is pretty much too many. In the next biggest iteration, the hallway has blown up about to business-corridor size; the final area is a whole unfinished room in itself, the arch of the doorway that used to meet the floor now suspended high in midair. You can, of course, travel this in reverse, or look at it from the exterior, where it looks like three ascending billboards or drive-in movie screens. 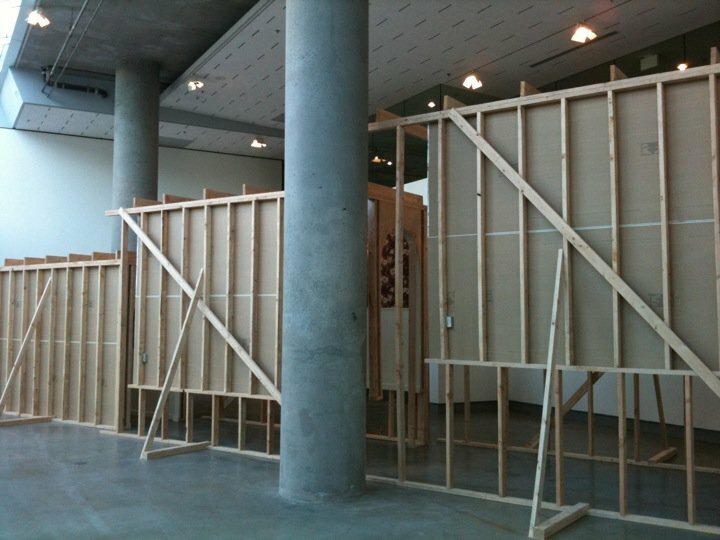 But all of Suarez-Wolfe's works are based on home, including the most well-known—a large wooden tumbleweed deposited in the California desert, made of interlocking house shapes, with road signs pointing to it (all of which were stolen due to their awesomeness). He's put himself in the company of surrealists and designers, and contemporary artists Andrea Zittel and Alex Schweder and Bruce Nauman, and at Open Satellite, a slew of non-art associations fly up, too: creepy Victorian theater with its Gothic wallpaper, the community redemption ceremonies of Habitat for Humanity, the 1990s book on architectural theory called Stud, Galileo's telescopic view, the zoom-out endings of certain movies, Russian dolls, collapsing cups, arpeggios. You might like to walk this hallway yourself and see what comes to mind.